Another Wednesday has come and gone, which means new comics, and when we get new comics there’s a pretty darn good chance that at least one of those books will feature our favorite Merc with a Mouth, Deadpool! 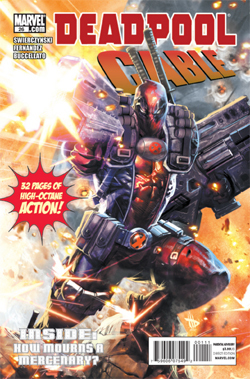 This week we’ve been blessed with Deadpool & Cable #26. Why is this the twenty-sixth issue? I’m not sure to perfectly honest the original Cable & Deadpool series lasted a full fifty issues so it’s not a continuation of that one. In the end, does it really matter? I say what matters is what’s inside the book that counts, but the cover of this issue is pretty cool too. This one-shot takes place a short time after the death of Cable during the X-Men’s Second Coming story-line that Deadpool claims ended very anti-climatically. We join Deadpool at the sight of Cable’s grave where he is trying to figure out the best way to honor his dead buddy. He considers taking cable’s robotic arm (which is all that’s left of him apparently) on a trip through the desert to bury it, or maybe just pouring some booze over the casket, but in the end Deadpool decides to go to Rumekistan, the country that Cable was ruler of for a brief time during the old Cable & Deadpool series, and set up a benefit concert to honor Cable’s memory. There’s a problem. The thing is all those Eastern European countries tend to get redrawn on the maps on a fairly regular basis, so the Rumekistan that Deadpool now finds himself in, is not the same one that Cable was ruler of. Deadpool’s inner monologue is very much aware of this, but Deadpool isn’t, so he goes around making a big stink of things until the Rumekistan government decides to throw him in one of their deluxe prisons for terrorists. While in prison Deadpool makes friends with prisoners who pretend to know who Cable is, hoping that Deadpool will free them all. Deadpool comes up with a quick plan to deceive the guards and soon Deadpool is free to wander the streets while reminiscing about Cable. After getting stupid drunk Deadpool ends up getting captured by the Rumekistan Government again, who are now really pissed off about all the guns Deadpool had shipped into the country. Wade explains that the only reason he had all the stuff shipped there was because it was all of Cable’s gear and he wanted it to be displayed in the Nathan Summers Museum. The Rumekistan leader then explains to Deadpool that he’s in the wrong country, and when he goes on to talk about an impending invasion Deadpool decides he has to help. So Deadpool suits up with Cable’s gear and singlehandedly takes out the invading forces. The Rumekistan government is so grateful they allow Deadpool to put on his Tribute Concert headlined by Lady Gaga. This was a great book, I was a big fan of the Deadpool/Cable team-up, and it was really nice to see Deadpool deal with the death of what is pretty much his only friend. What’s really cool about this book is if you never read an issue of Cable & Deadpool this book pretty much sums up the entire history that these two characters shared. Swierczynski really writes Deadpool well, this book is so crazy it really feels like a story that Deadpool is telling you. At one point Deadpool grows to be the size of a giant while he’s fighting the invading army. It’s done really well too, I had to look twice to make sure that what I was seeing wasn’t just my own imagination. The ending is perfect for a Deadpool book because by the time you get to the end you wonder if what you read actually happened, or if it was just something Deadpool made up in his own mind out of grief. This is a perfect stand alone issue for anyone that wants to read a good Deadpool story.